As we approach Super Bowl weekend, the Department of Commerce’s U.S. Census Bureau released Super Bowl-related facts and statistics examining the demographics of the host city, as well as the cities playing in the Super Bowl: the Denver Broncos and the Seattle Seahawks. Super Bowl XLVIII will be played Feb. 2 at MetLife Stadium in East Rutherford, N.J. This will be the first time the Super Bowl has been held in the New York City metropolitan area, as well as being the first Super Bowl played outdoors in the northern United States. 270: How many more people lived in Seattle than Denver on July 1, 2012, making Seattle 0.04 percent larger than Denver. 22nd and 23rd: Where Seattle and Denver ranked right next to each other on the list of the nation's most populous cities. The estimated population of Seattle on July 1, 2012, was 634,535. The estimated population of Denver on July 1, 2012, was 634,265. 8,978: Population of East Rutherford, N.J., location of MetLife Stadium where Super Bowl XLVIII will be played. 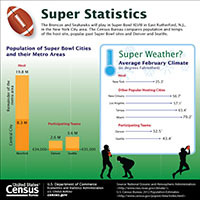 For more statistics about these cities, go to the Census Bureau's Facts for Features: Super Bowl XLVIII.